Earlier, this evening. . . I don't remember the last time I was outside. Just sitting. Just doing nothing. Well, okay, except for doodling words with a pen on a piece of paper. About, of course, nothing. I'm sitting on a beach chair on the front stoop. The mama is sitting in the back yard deadheading her pink daisies. The husband is standing in the front yard hand-watering the lawn. Uhmmm, that spray feels good. Me. I should be making dinner. And, I shall in a while. For now, I just want to enjoy a pause. I've been cooped inside spinning words and sentences into short, but clear and comprehensible paragraphs about stuff I have already forgotten. It's best to do that when you work on reference books. If I had retained everything I've written about in the last 13 years, my gosh... Ka-poosh! The sound of my brains exploding. Splattt. Splutt. Spposh. The sounds of my brains splashing on the walls and ceiling. Ah, yes. Imagination is good to have at any age. Now, I must go make dinner for the crew. This was a relaxing pause. It was. Relaxing is medicinal--it cures the soul. I'm reading Woody Guthrie's autobiography now,and your lively writing reminds me of his. fishducky, you are soooooo right. I think we all need to do more of it. 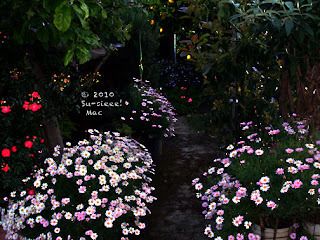 so mama is deadheading the daisies? what does that mean exactly? i myself have been accused of being a deadhead. i didn't realize i could spin it off as a verb. I know I wrote a comment to this but where did it go? Now I forgot what I said. Something like.... this is very peaceful, calming writing. It's like a pastoral painting.